"OH MY!!! First off, the painting is a wonderful emotional piece for us. It gives us a serene, peaceful feeling. The colors have a wonderful intensity and texture. It's so interesting to study it closely and see all the different subtle colors in the sky, in the trees... Nicely done! We will enjoy looking at this peaceful landscape that reminds us of home for a long time to come." My work can always be seen at the Sebastopol Gallery at 150 North Main Street in downtown Sebastopol. 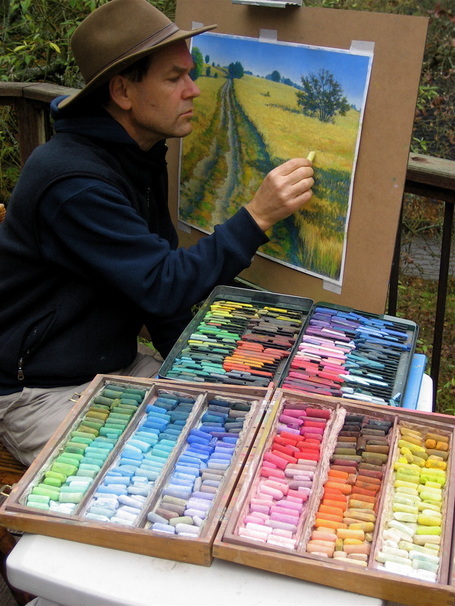 707.829.7200.
in June and Art Trails in October. My work is exhibited in many other art venues and forums throughout the year, including Corrick's at 637 4th St. Santa Rosa, CA. 707.546.2424. Some of my work can be purchased through Etsy, or simply by contacting me through this website. Private studio visits can be scheduled by appointment. ​Please let me know if a special commissioned painting would interest you. It's an exciting, collaborative process.